The top players in the world rely on custom tailored training programs to give them power, speed and endurance. A decade ago, a few players started the trend and proved that it gave them an edge. Today it's a requirement just to compete at the highest levels. But some players, such as Andre Agassi or Justine Henin-Hardenne seem to maximize the potential benefits. Physical training has become a blend of art and science, combining aerobics, flexibility, and strength training with on court movement drills tailored to the specific demands of the game. Players train in stages, combining the various training elements in varying amounts to produce peak performance at key times over the course of a year's competitive cycle. That's called Periodization training. Tennisplayer gives you the opportunity to follow these same awesome programs for yourself. At your level. Pat Ectheberry was a pioneer in off court training. He was the first to introduce it to Agassi at Bollettieri's. Over his career he has probably worked with more Grand Slam champions than any single coach in the modern game: Agassi, Jim Courier, Pete Sampras, Monica Seles, Jennifer Carpriati, Martina Hingis, and most recently Justine Henin-Hardenne, among others. 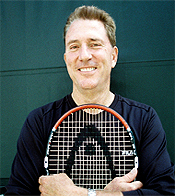 Paul Roetert is currently the director of USTA High Performance. He has educational, research, and training credentials matched by few if any experts in modern coaching. He developed the program presented here when he was head of USTA Sports Science. It forms the foundation for the way elite American players are training on a daily basis. As with so much of the information on Tennisplayer, I have a personal connection to this work. Following their programs was a tremendous challenge but the reward was worth it. It made a clear contribution to my competitive success. Not to mention what it did for my health and especially energy level. It's probably not a coincidence that I met my wife during the period when I was training the hardest and in the best shape of my life. We won't guarantee that last result for Tennisplayer subscribers, but think about ithere's a way to raise your game a level or morewithout having to actually change your game.